I've been asked a few times by some people to put one of these together, and after some time finally have the time to do it. I'm going to start with the very basics. This will start with introducing the graph editor. As the tutorials progress, we will work our way up to some more advanced things. Stayed tuned for a tips and tricks article. I hope to discuss topics including 'weighted vs non weighted tangents', 'spline vs linear vs stepped', 'How to change things quickly in the polishing stages' and many other fun things. And if you have any questions or troubles understanding anything fire a comment below, and I'll do my best to address it. So without further ado here we go. 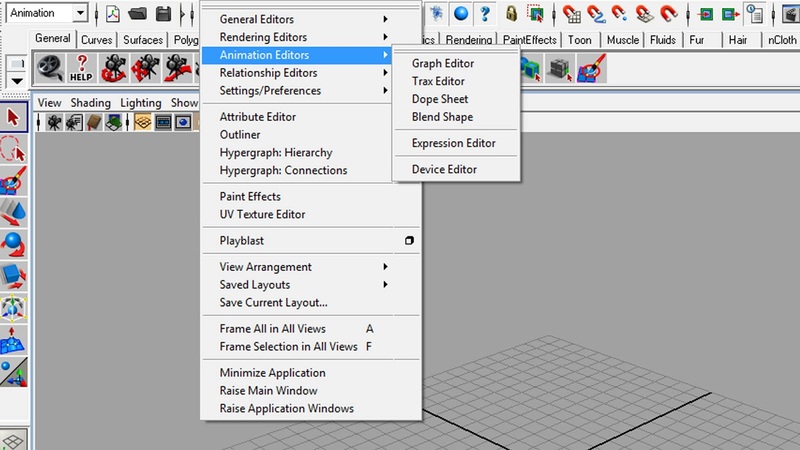 What is the graph editor? 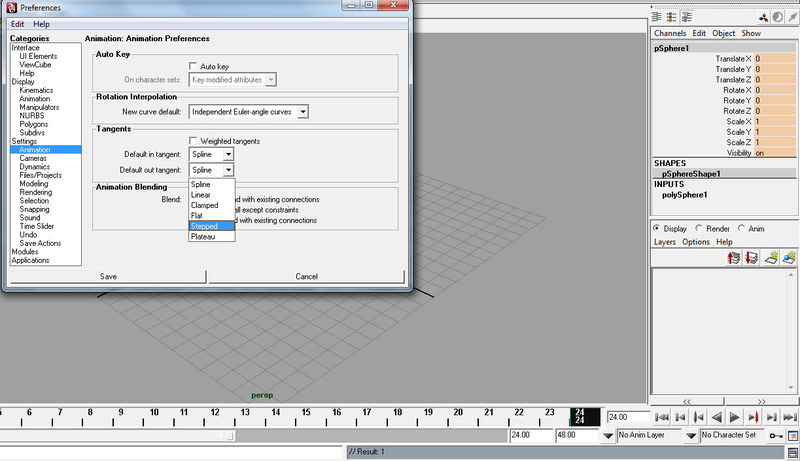 The graph editor is a basic visual representation of how an object is moving in 3D space. It shows you how the computer is interpreting the movement of that object, and where that object is in 3D space at any given frame. How do I open the graph editor? You need to have the object or control you want to view in it selected. 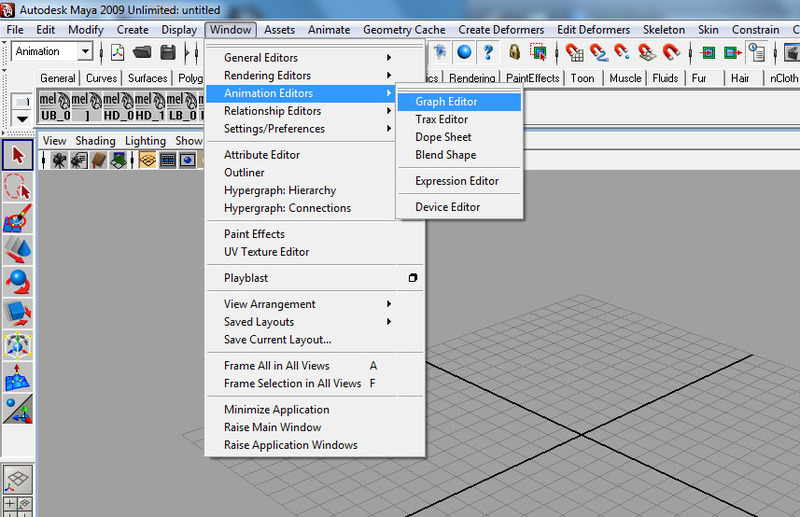 You can have multiple controls and objects selected and displayed in the editor at the same time. 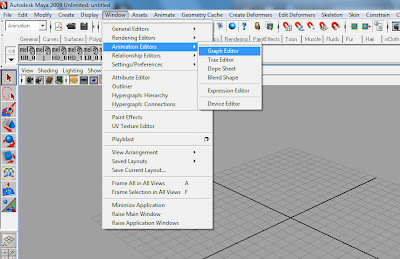 If you only want to see one particular curve you can select that in the left area of the editor. Tip: If a control is not showing in the graph editor, make sure you have set a key. For example, to show all attributes for a control (translate, rotate, scale etc), select the control and press 's' on your keyboard. 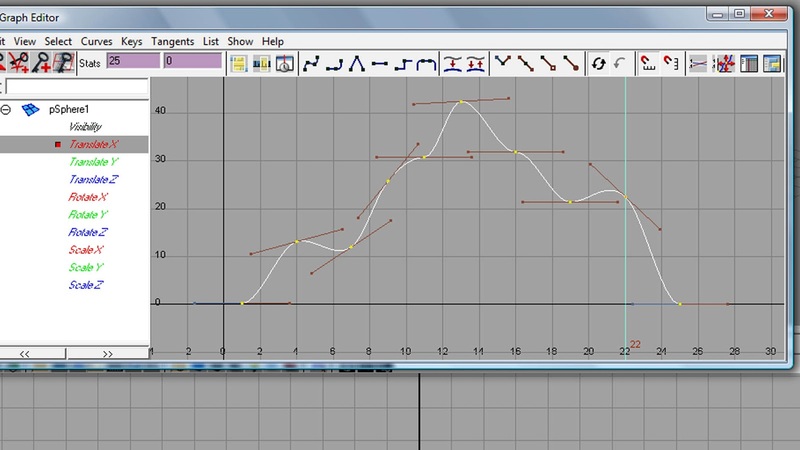 When I animate I want my keys to be linear/stepped/splined, how do I set it up so the computer automatically sets the keys as such? In the bottom right corner of this image you will see a red icon that looks like a man is running. That opens the preferences menu. Under settings you will see an animation section. With that selected you will see a section that has default in and default out tangents. 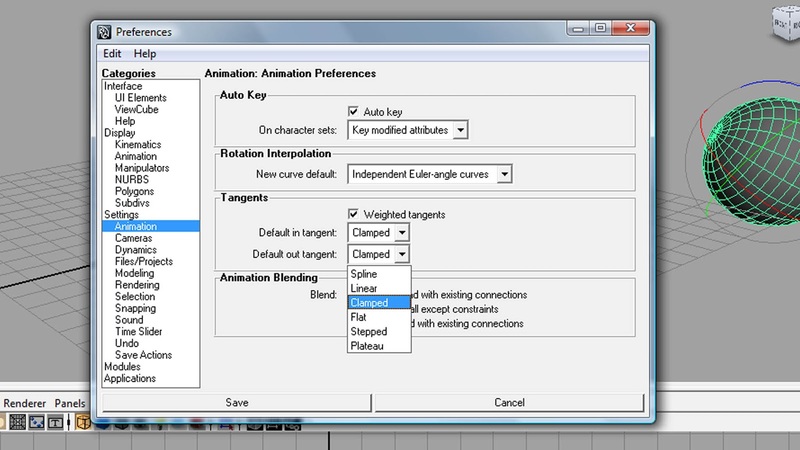 Simply select the mode you want maya to set your tangents to before you start animating. How do I understand what my curves are doing? In this image you will notice some numbers along the bottom. These numbers represent frames. You will notice numbers on the side as well. These numbers tell us where the object is in relation to its "world". 0 denotes that it is completely central in that axis to it's world. On frame 13, you will see a value of 20. This denotes that it is 20 x away from its world in x. At frame 24 it has returned to its world's central point again. So from frames 1-13 it travels a value of 20 x and from frames 13-25 it travels back. Notice the curve from 1-13 and 13-25 is a completely straight line. This means it is in "linear" Basically this setting is the computer saying the fastest way from a to b is a straight line. So it travels the same distance each frame to get to its destination. In this image is an example of stepped mode. In this mode, the computer does nothing for you at all. It lets you tell it what to do and how to do it, and makes no attempt whatsoever to solve how an object goes from a to b. 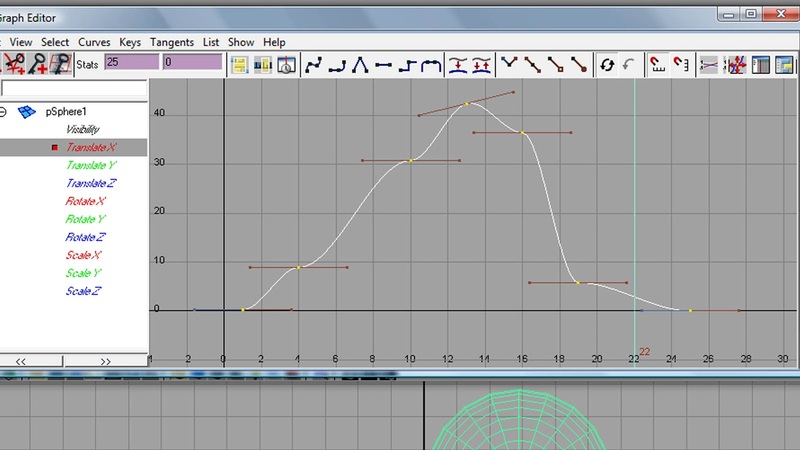 Despite all of these different curves existing, the ultimate goal of any cg animator is to arrive at a final splined curve. How you chose to get there is up to you. How do I want my curves not to look? The below is an example of "overshoot". This means the objects extreme, is not where you set it, which means it is hitting its extreme either several frames before or after you told it to, and the extreme or destination isn't even where you put it in the first place. This ultimately means you are not in control of your animation. In the next below example, you will notice the keys aren't really placed very strategically at all. I see this alot with animators who work in stepped mode, it will look great and the pose will look great, but the movement just isn't right. The extremes we had wanted were at 1, 13 and 25, but how we got there is very jittery and not smooth at all, which wont be very easy for our audience to follow. In the next image you will notice all the tangent handles are flat, so the computer is trying to slow in and out of the breakdowns we have set, which is going to make things very floaty and ugly. How should my curves look? There really is no right or wrong answer here. It all depends on what you want to happen, and where an object is in the rigs heirarchy. What you are doing, what you were doing before, and what you are doing next will have an effect on how your curves will look. But there are some general guidelines you can follow that may or may not help you out. Notice in this image how the object really takes it time in getting going, and really takes its time coming to a stop. This is typically how slow in and slow out should look on a control. So you are going to want to slow into that movement and pick up speed gradually until your contact. So your curve should look something like the above image. Sometimes you are just gonna want to throw on the breaks. But we don't want to hit one of those invisible walls, so in order to stop something we need to slow out of that movement. So you will want your curve to look something like this one above. Sometimes you are gonna want to get that bouncing ball feel. Either you are animating a bouncing ball, or a skip, a walk or a run, or a bunny hopping, or whatever. You are going to want your up and down curve to look something like this one. Just remember the longer it takes for something to rise to that up extreme the heavier it will look. The heavier it is, the faster it will fall. *Note that for all the diagrams I have used 24 frames and similar values, they are only a visual representation of how certain effects will typically look. There are millions of ways to apply these things. For the bouncing curve also note that I have broken the tangents handles, and is something I will cover under the next article on tips and tricks for the graph editor. For those of you that struggle with the graph editor, I really hope this article has helped you out. If there is anything you want me to go over in the next article let me know, and I will do my best. Last time I checked in with you I talked about how we all have bad days. Sometimes we just can't get what we want from our craft. There may often be times you watch work produced by your peers and ask yourself "How am I ever going to compete with the animator who did this shot?" If so, it's time to switch gears! Your new question should be "How can I learn from the animator who did this shot?" 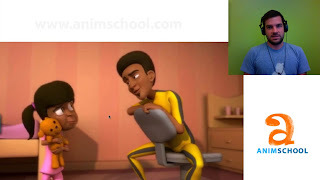 The ''Lozt Boyz'' post titled ''How I Study Animation'' offers a method to review work of your peers and also your own, in order to push timing, lines of action and other animation principles. This method can also help to provide feedback to others, offering a clear way to suggest improvements. I can often be found going frame by frame with my wacom trying to push poses and get into their head. Being able to dissect everything that an animator has done can help train your eye and improve your own work. Keep watching the pros work, but don't get discouraged, get inspired! During an 11 Second Club audio, your characters may go through several changes in thought and emotion. For the audience to empathise with your character, several questions need to be answered. Twelve of these are listed on Frank and Ollie's website, but we have highlighted a few below. a) Is the character doing only one thing at a time? b) Is the character putting over the story point in the scene you are doing? c) Can the audience tell what the character is thinking. d) Is it the simplest way to do it? So as a lead up to the main competition or simply as a practice, we invite you to animate a smile. Now, a smile is the one thing that can transcend language and cultural barriers. It is the single most important gesture and expression known to us. A smile effects the whole face, right from the eyebrows down to the chin. When we smile our whole face shows it. But a smile can of course mean so many things. As well as happy and joyful, smiles can be mean and menancing. 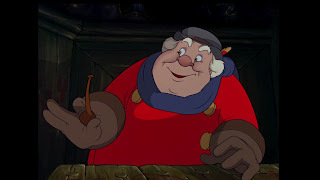 Just look at the range of smiles shown by the Coachman in this short scene in Disney's Pinocchio. Please click the pic to watch. So dig deep and think of a reason to smile. Be creative! You may wish to animate the whole body, but keep it simple. As always the animation could be anywhere between 75-125 frames. If you have any questions about submission requirements, please check How-to-participate section for more details. Deadline is Monday 5th March. In December 2011, Andrew Chesworth won his second competition in a row. His expert handling of anatomy invite the audience into a world, where a young kid is cautioned of the dangers that await in the mountain scene. Andrew's second win provided the opportunity to conduct a double interview, something I have dreamed of doing since taking the reigns from Eric Scheur. I enjoyed the challenge and wish Andrew many warm thanks for his role in making this happen. 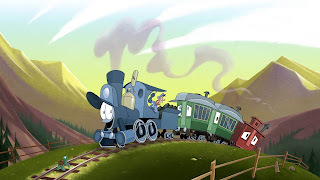 It was also of great excitement to hear BJ Crawford will be working on Andrew's new short, The Brave Locomotive, together with other great artists. Please talk a bit about your interview for your role at Disney. I actually didn't interview traditionally. I had applied via snail mail and through the website in March of 2011 but was followed up with an e-mail rejection notice in April. When they were looking for candidates for the Fall 2011 Talent Development Program, my friend Ke Jiang (an amazing modeler at Disney and former classmate from MCAD) pointed out my work to the recruiter (who wasn't aware that I had applied earlier that year), and I think that's why I got the call. Can you share anything about your daily experience at the studio. I love it. There is always something exciting happening, whether it's an animation department meeting, a presentation by Mark Henn, dailies with Rich Moore (the director of the feature film Wreck-It Ralph), and getting a lot of really exciting animation assignments to work on. The people are so fantastic and so inspiring, and it's a privilege to be exposed to so many talented and influential individuals. You have mentioned already seeing an improvement in your work since joining the studio. Please expand upon this. Seeing my work in context alongside the work of the other animators here has its own way of informing me where I must improve. Also, just talking shop with the senior animators clarifies areas that need to evolve. There is an osmosis of learning in seeing everyone's approach to animating, and with that much social overlap there is bound to be a lot of rapid collective learning. You tend to feel like your work is very naked and exposed to dozens of pairs of discerning eyes... and you adapt pretty quickly to try to avoid basic criticisms so that the more sophisticated aspects can be evaluated. Working here has also allowed me to have aspects of my work described to me in conversation by other artists in a manner that didn't happen until I came here. It's easy for me to see how house styles develop naturally in a studio, with so many artists trying to keep up with each other. I believe building a good partnership is key in a mentor- student relationship. Please comment and talk a bit about studying under Malcon Pierce. Haha, sense of humor plays a big role, and there is no lack of comedy involved while learning under Malcon. He makes everything very approachable, and he knows how much I respect his feedback and his ability to zero in on elements of the work that can be improved. He and I both respond to very graphic aspects of animation, and it's a language I am very comfortable with. Malcon is equally in touch with characters' personalities, as well as just what's plain entertaining to watch on screen. In our last interview, you talked about receiving advice from Eric Goldberg. Eric's strength of posing on the Genie is something that remains complex to achieve in 3D. Please talk a bit about the advice he has provided to you. The few times that I have been privileged enough to interact with Eric at work have been very enlightening. I recall his feedback on my Palm Springs short - he stressed loosening up my poses and motion a bit, to get as much softness and pliability in the forms as possible. He also advocated the classic principle of pushing contrast in characters' motion. He cited that the femme fatale in the short could have been animated a bit softer and curvier in her movements to match her physical form. The short is so fast that the characters tend to rubber-band snap into a lot of their poses to achieve the storytelling, and in that process there were possibilities of movement unexplored to further differentiate the characters. The principles he is talking about apply to any medium of animation or film acting if you look at the basic ideas. You also mentioned your New Year's Resolution was to animate in a different style than you have used before. Please talk a bit about the animation styles you admire and may wish to explore. Speaking of Eric, I am always looking for opportunities and legitimately good reasons to do assertively broad animation. I absolutely love the Disney aesthetic of the 1940s from films like Pecos Bill, Little Toot, Ichabod and Mr. Toad, and Song of the South. I have an almost insatiable desire to watch animation with that kind of broad appeal and boldly defined personality, and those are the types of films that not only made me want to be an animator, but to draw. That said, I have just as much room to explore the more subtle, naturalistic side of animating that I haven't before. Artists tend to progress their styles gradually, and I want to take logical risks that feel like they are coming from a place I have been before, but are leading to somewhere that I haven't been. That is starting to sound a bit abstract and high-concept... but I think you get the idea. I think a bold experiment would involve giving myself a visual limitation of some kind. An example (and not that I necessarily will do this) would be to do a piece of work in a Picasso-inspired cubist style, and still try to imbue character and clear narrative in the animation. Your personal blog presents some beautiful production artwork for ''The Brave Locomotive''. Please introduce your short film to the 11 Second Club community . The film is narrated through song by a talented female trio akin to the Andrews Sisters in the vintage boogie woogie style, and the music was composed and conducted by Tom Hambleton. All of the base track for the film has been recorded and put through editorial to my storyboards. It's a very fast-paced film that covers a lot of big story points, and the motivating force was the desire to tell a classic story of a fractured friendship through a style of music and broad animation I am very passionate about. Friends in the know have picked up on the American Legends vibe of the film. 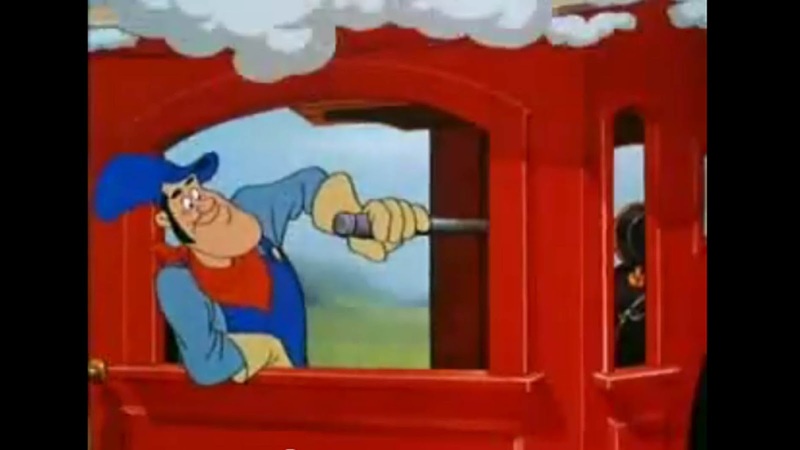 The film is mostly in 2D (specifically the human and fully organic characters) and animated digitally, with a lot of hybrid CG techniques to realize all of the highly caricatured anthropomorphic train animation. In the next few months, the trailer for the film will be online, along with a Kickstarter page to further advertise and acquire artists to animate sequences on the film. BJ Crawford, Justin Weber, Amir Avni, Chang Dai and Joe Merideth are already committed to scenes in the film, and each animator is cast to a scene and character appropriate to their animation style. 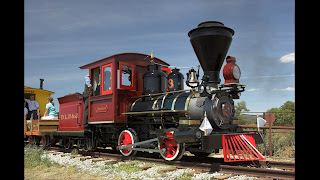 Have you visited Ollie Johnston's train ''The Marie E''? Sadly, no. My life is not yet complete. I can't truly call myself a Disney train enthusiast until I have done so. Please talk a bit about your hobbies outside of animation. I play tennis, and I go running outdoors a lot, because they are physical activities I enjoy tremendously that allow me to forget how much time I spend sitting at a desk. I also find tennis an exciting sport to watch, because of how individual the narrative is. You are watching an exciting kinetic drama unfold in real time. When I was in high school and playing the sport competitively, professional tennis was going through a very exciting time. Sampras and Agassi were approaching retirement and still playing very competitively, newcomers like Andy Roddick and the Williams sisters were making a huge dent, and I was loving following all of it. When the animation bug really took over my life, I didn't follow the professional sport as religiously (especially after Sampras retired), but to this day I always light up when there's a tournament on TV. Looking at your portfolio, you had the experience to direct commercial animation. I particularly enjoyed Golden Grammies. Please talk about balancing the opportunity to explore character while working with the budget and brief constraints that commercial animation presents. I think the entire timeline for Golden Grammies from start to finish was just under a month. It was a breakneck and completely fun experience. I did the character designs, and also supervised the storyboards from a scenario concept by Aaron Quist. Modelling was accomplished by other artists at Make, and then I did a lot of the character rigging, specifically the body controls and the skin binding. That took up half the production, just building everything. I even managed to provide the voice of the tiny bespectacled Granny in the red blouse. Kevin Wisdom animated the first 15 seconds, and I animated the last 15 seconds. That was probably a week and a half of animating. The last week was polishing up the post-production and compositing. The whole concept was that Golden Grahams was just BEGGING to have a parody of the Golden Girls as a potential mascot, and we pounced on it. Whether or not it was viable is up for grabs, but we found it pretty amusing. And somehow it got executed! With commercial deadlines, you just have to go with your gut, and I think there is something to that. It really is possible to over-think decisions in animation, and in commercials you don't have time to, so you go with what works. From a certain point of view, it's a really solid training ground for learning how to execute with confidence and discipline. There's no beating around the bush. For production of your short film 'Mortimer and Bracket', you took upon many roles including director, writer and animator. With a focus on story and character, please talk a bit about the film and the lessons you learnt through its production. The biggest lesson for me was, the first film you make is probably not going to be very good... so get it out of the way as soon as possible! Mortimer and Bracket served that purpose for me. It lags a bit in the second act - truthfully it should probably be less than five minutes instead of eight. As a film, it really needs a chainsaw taken to the editing. And as animation, it really tries to rely too heavily on splines and not enough on great graphics images - and it shows. I don't think there are very many still frames in the film that hold up as solid complete poses, if any. It's more just a series of disconnected, amateurish moving parts. But, there were several good things about finishing a film like that essentially on my own - notably knowing how much has to go into every aspect of a production, as well as time management and budgeting assets. It was a very practical experience, and in the end the film seems to have acquired a modest viewership. But it doesn't stand up to the test of time or maturity, in my opinion, and I'm glad I made it so I could learn from it. Do you have any ambitions to one day direct a feature? I have at least three ideas for animated feature films that I am extremely passionate about, and would love to see realized on screen in animated form. With how far technology has come in the last few years, I'm confident they would be fantastic in either the hand-drawn or CG format, as long as they were art-directed in accordance with the tone of the story. What was your reaction to your eCritique? I thought it was pretty on the money. I laughed about the eye line of the little goat, because his eyes are basically pupil-less shiny black pearls. With characters like that, the head orientation is all the more important. I appreciated how much Jay is invested in his knowledge of animal behavior, and my favorite note was that regarding the prowling cat. Objectively, there was nothing I really disagreed with. I was pretty confident in most of the choices I made all things considered, and his notes about animal behavior resonated with me the most. Jay Jackson provided some tips on animating animal behaviour. Please talk a bit about the challenges your choice of characters presented. Anatomy, anatomy, anatomy. I looked at a lot of reference - video, illustrations, diagrams, and written, to prepare myself as much as possible for a crash course in the two types of animals I was animating. I made it a goal to push the contrast in weight, attitude and movement of all three characters, and despite some missed opportunities that Jay pointed out, I am pleased that that objective came through in the end. The most unusual part of the planning phase was shooting video reference of myself acting out the poses I saw in my head, and filtering that through what is possible and believable for that animal's anatomy. December's audio clip included the challenge of a storm sound effect. Please discuss your response to this in order to create a believable environment. I knew I wanted something epic, and I am a pretty experienced compositor of 2D animation so I knew I wanted to feature an atmospheric environment this time around to complement the audio. 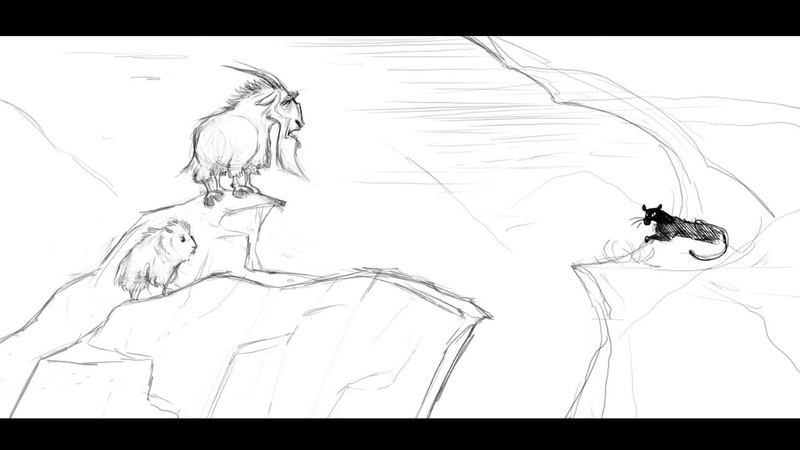 I felt like my decision was a pretty literal one, and the audio easily supported my initial impulse to animate mountain dwelling animals. You have now won two competitions in a row. What advice would you give to anyone entering the competition? Take it seriously - treat it like a job assignment. Give yourself strict limitations, and follow them. Emphasize communication and clarity. Be unexpected but reasonable - don't force the audio to bend to your idea, bend your idea to suit what is believable within the context of the audio. The winners of the competitions I think always make something believable out of their idea, even if it's really far removed from the source material. Also, don't submit it before going through a revision pass. Show it to people who will tell you what they honestly think, and who won't just say "Looks good, man." Both of my entries received very blunt critique from respected peers, and they benefited tremendously from it. Animation is about communication and entertainment. Is it enjoyable to watch, and does it make perfect sense? If it does, fantastic! Then you can focus all of your energy on making it look really slick. But if it doesn't meet the first two criteria, then there is more preliminary homework to do. 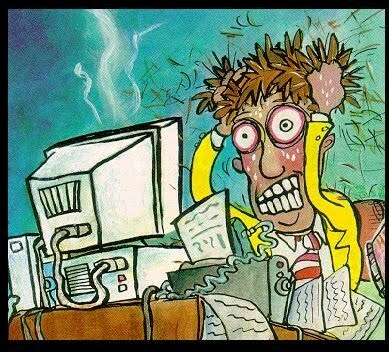 Head over and read a new entry over at Animator Island and read Tips for Drawing: Bad Days Happen. I often get frustrated when I have a bad day and just can't get the look I'm going for. If I'm animating, painting, sketching or any of the creative outlets I pursue the one thing that stays constant is that some days I fight to do it. I recently came to the realization that the best part about making art is when you can see it in your head and everything you try looks nothing like it. Now that I gave you a quote I might as well give you a few more to drive the idea home. An important aspect of building a successful animation is developing a workflow that works for you. Its important to start by understanding the rig you are working with. Each has its own strengths and weaknesses. Glen Mcintosh discusses in an Animation Mentor post the importance of simply selecting keys and finding out how different parts look rotating and translating, before even a key is set. In February's AM Tip of the Month, Jim Brown and Brian Mendenhall discuss how their workflows can develop and change depending on the shot. Of note, they discuss the importance to understand know how you will work your way out from blocking to splining. On Carlos Baena's personal website, AM's co-founder discusses in detail his planning for Pixar feature film Incredibles. From researching what has been done before, to thumbnailing to shooting footage with a camera, the post is a indepth informative tutorial that forms an amazing read. Lastly, I wish to leave you with an Animation Lounge interview with Shawn Kelly. With his animation celebrated already for his work on Yoda and the Hulk, Shawn's indepth discussion covers content which is as important today as it was when written in 2006. I've been sitting on a few links all week so lets get to it. Onanimation has posted a great interview with Fraser Maclean, the writer of "Setting the Scene: The Art and Evolution of Animation Layout." Have a look for some great insight and fun pictures. Bobby posted a great observation on his blog about peoples reels and how they frame their shots. The second one I need to get much better at. The final blog post comes from Animator Island. The idea that messing up is part of the process is something I struggled so hard with this for so long and now I just go over things over and over. My first animation teacher did it to me when he suggested that I only sketch in pen. The idea sounded nuts! After 5 years I still only sketch in pen, books and books full with drawing over drawing layered on top. Thanks to Eric Swymer, a friend I met through the 11 Second Club, I had the opportunity and privilege to interview Disney's youngest director, Tony Bancroft. When Eric mentioned this opportunity, I feel most embarrassed to say, I had not heard of either Tony or his twin brother Tom. Yet after a look Tony's long credit list and star-gazing at his reel, I now feel blessed to have been introduced to such a wonderful artist and an amazingly beautiful portfolio of work. I wish to thank Tony for his time and really hope you all enjoy the read! If you wish to watch his reel first, please click here. With two very talented twins in the family, what was it like growing up in the Bancroft household? Pretty normal I guess. Or at least as normal as two tall, skinny twins who only liked to read comics and draw can be in a family. The good thing is that my brother Tom and I knew what we wanted to do since we were 3 years old. We literally grew up drawing. It was the only thing we knew or cared about. We were not into sports like most young boys but we were competitive in our drawing. We would always critique each other and go over each other’s work until we felt it was right. We really sharpened each other. When did you realize you wanted to become an animator and how did you go about pursuing your dream? Tom and I grew up tracing and drawing from comic strips and comic books primarily. We really didn’t get into animation until college. Animation was a mystery to me. I didn’t understand the timing aspect or how you made drawings come to life like what I saw in the cartoons. Animation might as well have been rocket science to me. I thought that I would never get it so I settled into thinking of myself as a future comic strip artist like my hero Charles M. Schulz (Peanuts). Tom and I got all the way into a junior college and still planning on making it big with the comic strips we were creating. At least until we met a guy that was doing these strange and wonderful little films out of clay. The animation was crude but it was fun and alive! 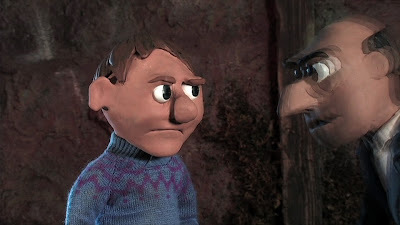 We got to know this guy and ended up making a clay animated film with him that summer. It is horrible to see it now but at the time we felt like Dr. Frankenstein breathing life into the monster. We were creating life! So, Tom and I were hooked. We read every book on animation that summer and by the end discovered the college California Institute of the Arts (which had the number one animation program in the world at the time). We were excepted into the character animation and taught by the very best in the industry. It was heaven! Were you inspired by any characters/films in particular? I have always been a big fan of the early Warner Brothers shorts. The work of Chuck Jones especially. One of my earliest remembrances of a Disney film was seeing Lady and the Tramp and loving it. I was amazed at how the animators brought such humanistic character and mannerisms to characters that were still very much dogs too. I also remember being blown away when I saw The Great Mouse Detective. I was in Cal Arts at the time it came out and went to a screening where some of the lead animators where speaking afterwards. I felt like I was meeting rock stars. Of course, it was surreal when just a couple of years later I would be working with them. How influential was the creative environment at Calarts to your career as an animator? Hugely! It was at CalArts that my passion for animation and film really developed. My brother Tom and I were there together in a freshman class that included Pete Docter, Ash Brannon, Mark Kennedy, Donovan Cook, Jim Capobianco and many more inspiring arts. We were all just young and on fire for animation. We learned from each other as much as we did from our teachers. But our teachers were awesome too. We had Chris Buck for animation, Joe Ranft for story, Mike Giamo for character design, Dan Hanson for layout and of course, the legendary Bob Winquist for design and leading the program. We could kind of do anything with our films. The only suggestion was that it had to be silent (first year) and around 1-3 minutes in length. We had classes too but our main thing was our film each year. It was an awesome time that I will never forget! If you had the opportunity to work on any feature film (doesn't have to be Disney), which would you choose? That’s a tough one, but since I grew up loving comic books so to do something with superheroes would be a dream come true. I think if The Incredibles was a 2D film that would have been perfect for me. Can you imagine? It was great as it is of course, but to do that move in traditional animation would be cool. Lion King was released in 1994, yet witnessing the ''25 days of Pumbaa'', your enthusiasm for the character still seems so alive. Please talk a bit the importance of sustaining passion in your work. Well, it’s easy for me to sustain that passion with Pumbaa. He was my first character that was my own to create (supervising animator) and I have always had an affection towards him because of that. Also, because The Lion King seems to NEVER go away (3D, DVD, Blu-Ray, Broadway, etc.) he seems to always come back across my drawing board. I have probably drawn Pumbaa twice as many times since the movie came out than when I originally animated him for the film! Most recently, over the last 5 years, I have animated him for a series of “safety smart” Pumbaa and Timon videos that Disney puts out for schools around the world. So, he just kind of lives on….and I’m good with that. 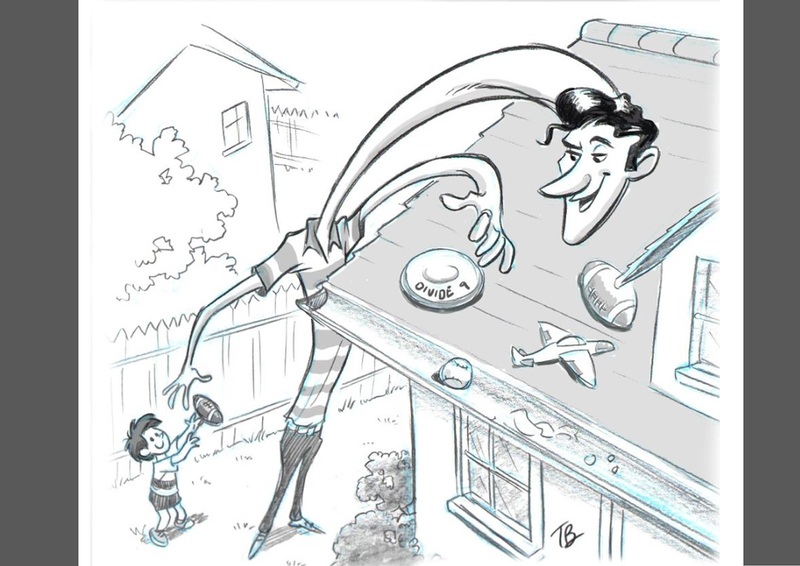 In your brother's Animschool webcast, Tom began speaking about the need to find a balance between family life and artwork. Please may you expand on this idea. Yes, I couldn’t agree with my bro more. This career of animation can be all-consuming if you let it. There is never enough that you can learn, study, draw and animate to make yourself better. Which is good! We should always be growing and improving as artists. But we also have to have BALANCE in our lives. It’s the experiences and emotions learned from human relationships and doing other things that can also help in your work. It’s the other things in life (friends, family, church, travel, etc.) that will bring you true joy in life so don’t short change them. I hate to put it this way but, most likely, it will be time spent with family and not alone at the drawing table that you will desire in your last moments of life on this earth. You have worked on many films with your brother Tom. Please talk a bit about working on the feature film Mulan. I would be interested to know if being family allowed for further support or pressures while listening to each others' ideas? Mulan was an incredible experience for Tom and I. But it was a tough one too. Between the two of us, Tom was first on the film because he was already down at the Florida studio helping to develop some of the characters for a good 6- 8 months before I came on. He and the group down there (lead by my co-director on the film Barry Cook) where developing the story and experimenting with characters and design. I was finishing up press stuff for The Lion King and had gone onto supervising the animation of the gargoyles on The Hunchback of Notre Dame. Tom would tell me about the film all the time as we talked long distance almost every day. I was at the CA studio and he in Florida but because we had Disney phone connections between the studios we took advantage of the free calls! I knew that he was excited about the film being Florida’s first on their own without the CA groups involvement. Tom and several of the animators down there really wanted to animate Mushu. This was Tom’s first go at having his own character on a major film and he was really competing to get it. But the studio didn’t want to do any final casting choices until the second director came on. When I was asked to co-direct the film with Barry it was a surprise not only to me but to all of the animators in Florida. The Florida studio is where I got my start at Disney as a low ranking clean-up artist and that’s how I left it. Then I went to CA and got into animation and rose up the ranks pretty quick. Now, I was coming back as all of these guys boss- including my brother! You can imagine that was a very difficult transition for me and them. I learned very quickly that respect is earned and doesn’t automatically come with the title given. But in regards to Tom, I really did think that he was the best choice for Mushu but it was tough to give him a star character like that without it looking like nepotism. The good thing is that Tom was Barry’s first choice too. After the casting was done there was still the difficulty of developing a boss/ employee type relationship with your brother. I think a lot of the onus fell on Tom’s shoulders to see the difference between when I spoke to him as a director or as a brother. To Tom’s credit he dealt far better with it than I think I would have. There were still challenges but we came through the process closer and happy for the experience. I don’t think Tom would want to work for me ever again though! Again focusing upon Mulan, the feature landed you the title of Disney's youngest director. Was having the opportunity to direct an early ambition of yours? Yes, it was. My mother always taught us to dream big and go after those dreams. So, when I first started at Disney, I first wanted to be an animator and then a director. The only thing is, back then, it took a good 10-15 year process to become a director- if you were lucky. It was just that there were not too many films going on at once and there were already a lot of director talent occupying those positions and even more that wanted to transition into them. The competition was huge. Besides, being a man of prayer and faith, the only other thing that I credit was me telling the right person at the right time that I aspired to directing. 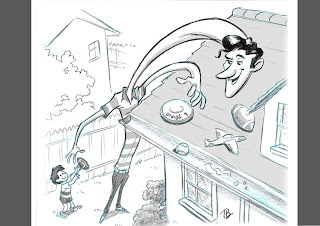 It was late one evening in Florida when I was there working on an animation test to move out of clean-up that I struck up a conversation with Rob Minkoff. Rob was down at the Florida studio directing the first project we produced there, a Roger Rabbit short called Roller Coaster Rabbit. He asked me what I was doing there so late and I told him I was animating a test scene in hopes of getting promoted one day to animator. He asked what did I ultimately want to do at Disney and I replied, “to be a director like you one day”. Now, fast-forward 5 years later, after I had become a supervising animator, and Rob had just finished directing the blockbuster The Lion King. He was walking out to the garage one night with the Vice President of Development Tom Schumacher when he asked Rob, “do you have any ‘out-of–the-box’ ideas of a director that could be a good partner to Barry Cook in Florida for the new movie Mulan?”. And Rob remembered our conversation from years before and mentioned my name! Coincidence or divine intervention? You decide. 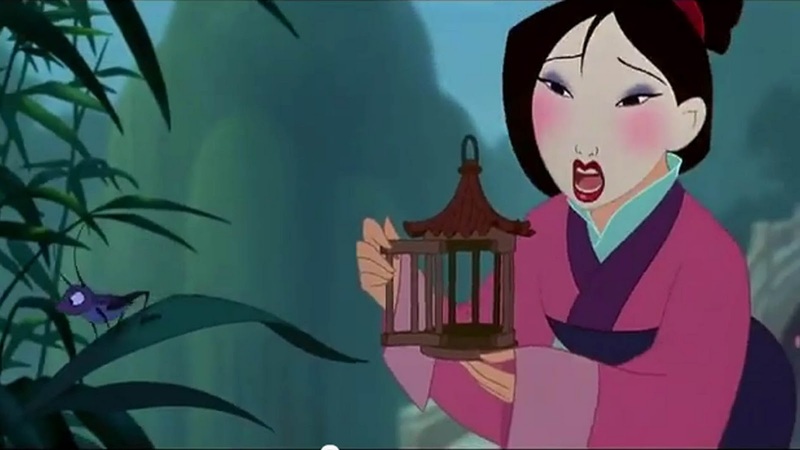 Once more on Mulan, the film introduced the world to the beautiful songs I'll make a man out of you and Reflection. Please talk a bit about how you feel music contributes to animation. I actually love the songs in Mulan and think music has been very key for animation over the years, but Barry and I did not want any songs in Mulan. It’s true! We produced Mulan during a time when the studio gave us a mandate that it had to be a musical. This was during the time of Beauty and the Beast, Aladdin, Hercules, Hunchback, etc. and everyone of them was successful, most executives thought, because they were musicals. So, when we first started to develop Mulan it was planned early on for it to be one too. But just as some stories benefit from the addition of songs in their storytelling, some stories don’t. We worked hard to integrate the music into the telling of Mulan’s story but part of me still thinks that it would have been just as powerful (and perhaps more so) without them. If you had to choose one or two shots that you are most proud to have animated, which would you choose and why? Talk about picking your favorite children… That’s a tough one. I think of three off the top of my head. 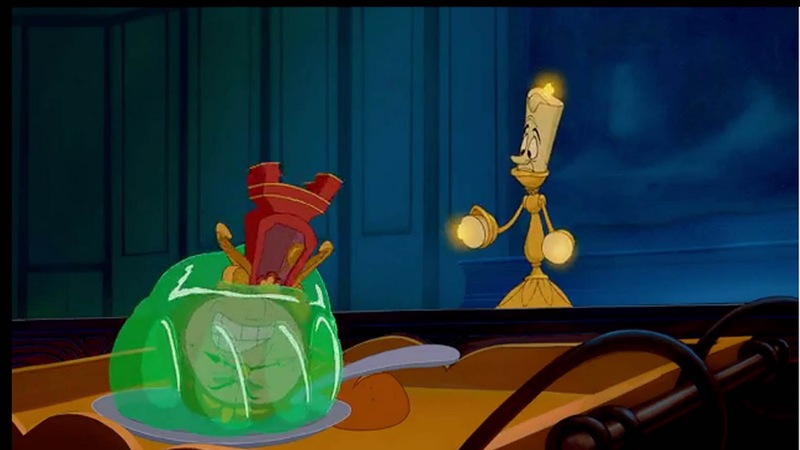 First, in Beauty and the Beast I animated the scene of Cogsworth the clock as he falls into the jello in the “Be Our Guest” song. It was one of my first scenes as a full-fledged animator and I really got into the dynamics of movement between him and the jello. I even had my wife make me some real jello which I took to work and dropped under the camera to study the movement frame by frame. Secondly, in The Lion King when Pumbaa describes the stars above as “ balls of gas burning billions of miles away”. That scene was pivotal for me in understanding that Pumbaa was not stupid as much as he was an innocent. Something that helped me in cracking the nut of his character and helped for the rest of the film. 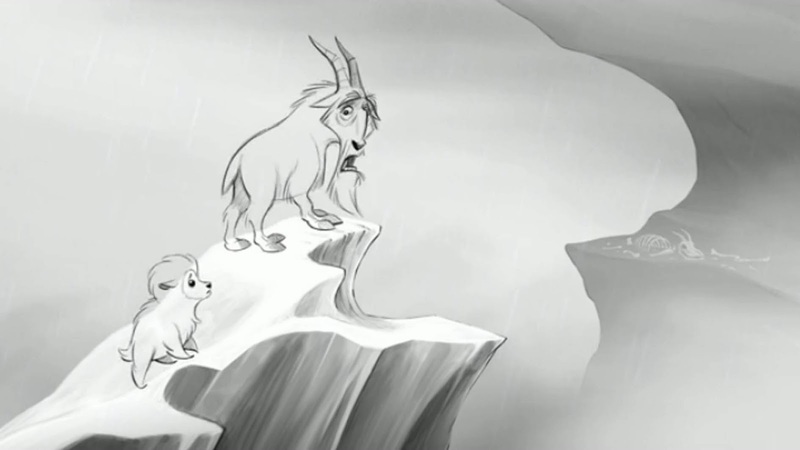 And thirdly, animating Kronk discussing his problems with his shoulder Angel and Devil in The Emperor’s New Groove. That was just plain fun! I simply must ask your thoughts on Beauty and the Beast. I particularly love the scene of Cogsworth, where he tries to save himself by laying blame upon his friends. Please talk a bit about your experience animating Cogsworth. Thanks! Cogsworth was a real fun and challenging assignment for me. I was promoted to animator on that film and working in Will Finn’s Cogsworth unit. The great thing about working with Will was that he was very supportive and generous as a mentor and a supervisor. That scene you mentioned should have been done by him really. It was a single character personality shot that new animators never get. Up until that scene I had mostly, animated shots of Cogsworth where he was in a group not talking, small in a scene, or running up the stairs. It was a great opportunity and really helped my career to work with such a generous supervisor. 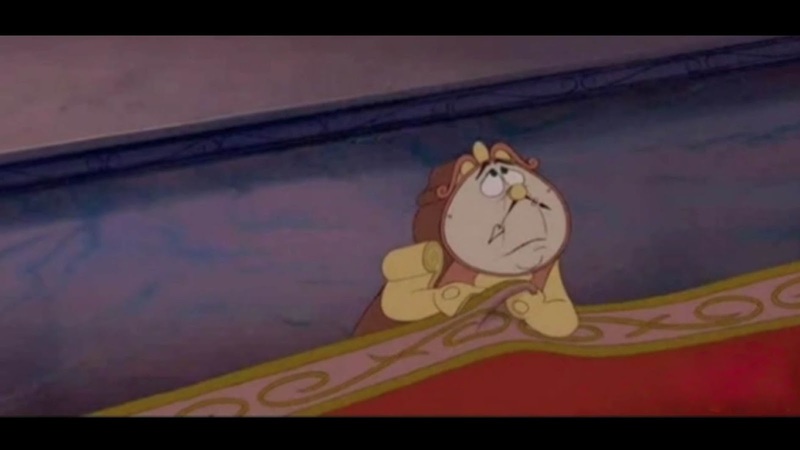 The other thing about Cogsworth was figuring how out to pose him and make him humanistic while still having him feel like an object made of wood and metal. 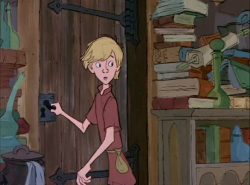 I looked at the doorknob character in Alice in Wonderland for reference. I loved how Ollie Johnston solved dialogue problems of this key hole that has to also be a mouth. Just genius stuff! The toughest thing to solve for Cogsworth was getting his stand to operate like legs when he had to walk or run. That’s the kind of fun problems we animators have though. 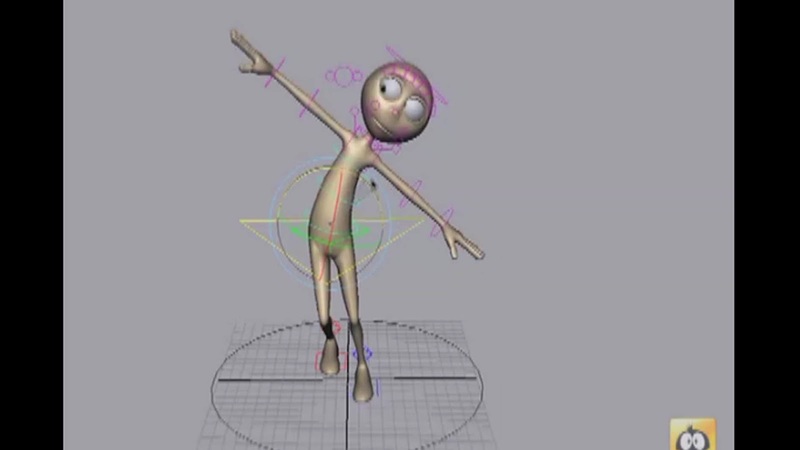 As well as animating new characters, your reel includes animation on Mickey Mouse. Please talk a bit about your own values towards Mickey and your experience of working with him. Yes, I was privileged to animate Mickey Mouse in a commercial for the Disneyland parks last year. I animated almost the whole commercial myself and it was awesome! 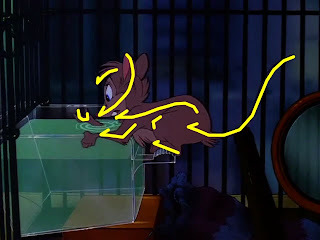 I think every Disney animator wishes for an opportunity to animate the mouse and mine finally came after I left Disney! My goal for that commercial was to echo the drawing and acting style of Freddie Moore. He was the animator that really created the child-like and appealing version of Mickey that most people know and love today. Mickey is so much tougher to draw and animated than you would think and I worked hard at him since this was my first time. I felt pretty good with most of my scenes though. Please talk a bit about how you believe traditional animation has developed in modern times. I am one that still thinks there is a place for traditional animation in this world but I do think it needs some reinvention. I think traditional animation will have to involve many of the new digital software to make it seem fresh again. Things like After Effects and Flash to give it new looks and stylized presentation. I think the old Disney way of doing traditional is a thing of the past just like musicals and princess stories seem out of date. What advice would you give to help people find character when approaching a new project? Do your research first. Spend time thinking about who the character is in the story. Ask yourself, What makes them tick? What is the subtext, if any, behind the lines you may be animating? How does their movement and acting differ from other characters in the story and therefore make them unique? Then spend time thumbnailing (small quick drawings) unique poses and acting that fills “real” or believable for that character. Believability is the key. If you don’t believe that this character is living and breathing then the audience won’t either. The animation industry can be tough and challenging. In times of trouble, Pumbaa would advise to ''put your behind in your past''. What advice would you give? It’s going to sound simple and contrite but, “work hard and keep trying”. That is what will separate you from the rest. We were all born with differing degrees of God-given talent, but it’s what we do with it that will set us apart from the crowd. Also, set your goals high. I didn’t just want to be a Disney animator one day, I wanted to be a supervising animator and then director. I never let up on my dreams and worked hard to achieve them. You can do anything you put your mind and determination towards. I really believe that. Animation still has a long way to go. There are stories yet to be told and characters needing to be created. Go for it! Here is a video tutorial on creating a motion blur effect in stop motion animation. Strobing is a problem that can occur in stop motion animation when movement is so fast that the movement appears to pop across the screen. This happens when the object moving does not overlap itself from one frame to the next. In computer animation, this is fixed by checking the "motion blur" box in the rendering preferences. 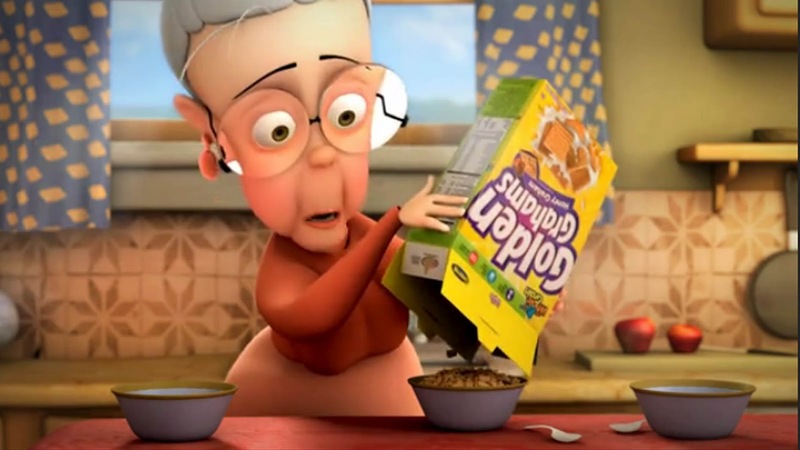 In hand-drawn animation, motion blur is simulated by drawing the blurring effect. But it's trickier in stop motion. A process called "go-motion" was developed in the late 80's that moved the puppet during the exposure, causing that part of the puppet to blur. But who can afford a motorized puppet? So I developed my own way of creating a motion blur effect that calls for a bit of additional editing. Certainly adding motion blur to bad animation won't make it better, and plenty of great stop motion animation is produced without it, but I think it's a fun effect. It's a way of smoothing out fast moves, and can be done in a subtle way so it doesn't draw attention to itself. Mark Harris is back with another AnimSchool Review, this time exploring the beautiful work of Edwin Schaap. Edwin came 4th place in our monthly competition for August 2011. Of particular note, Mark discusses the idea of Uncle Eddie's fiery eyes being disruptive to the scene, because it does not fit the story set up. For more detail on this idea, please read Ed Hook's thoughts on Pixar's Up discussed in Acting for Animators. Great work and great review. Please click the pic to watch! First up is a tumblr full of animation gifs juxtaposed with the frames they represent. 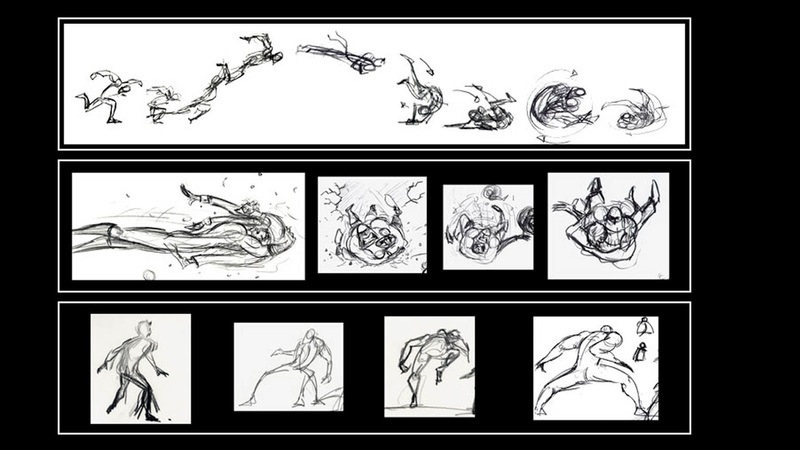 Frame by Frame is a great resource for studying short clips of animation. Make sure you look for all 12 of the principles in them. Next we have what looks like a great set of tools for Maya. I noticed them starting to float around twitter so I had to take a look. In all there are 12 scripts for daily use that creator Morgan Loomis has shared with us. Included among other great tools are a substitution tracer, a breakdown and a hold assistant. To download go to the blog. Recently, Mulan Co-director Tony Bancroft provided an inspirational guest speech at the 2011 Animation Film Festival located at the Academy of Art University's School of Animation & Visual Effects. Please click the image to check it out! Of interest are his thoughts on the current condition of the 2D interest. With executives choosing to invest their money into 3D projects, it is difficult to see where the next huge traditional feature will come from. Have we truely seen the end of films made similiar to Lady and the Tramp, Lion King and Beauty and the Beast? Let's hope not, but instead look forward to a time when doubters may bow and acknowledge another 2D masterpiece. Of interest is the article, How Basil Saved Disney Feature Animation, published by Mouseplanet.com. 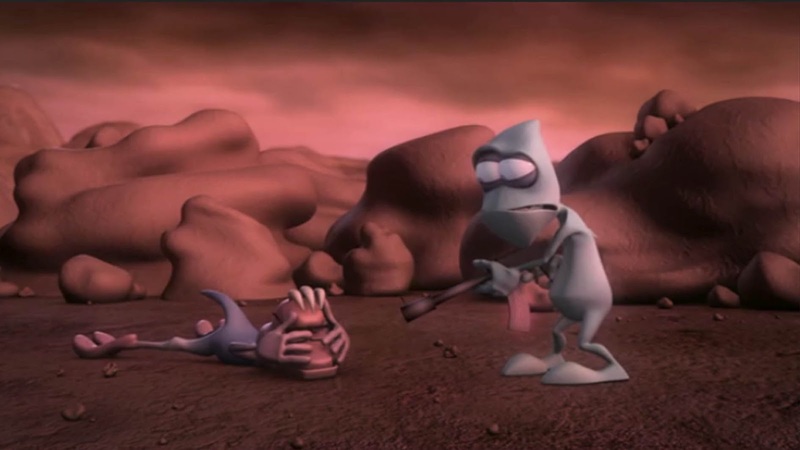 The Disney feature was produced during Tony's student studies at Calarts. Who could have predicted then that a mouse would pop up and save the day, opening the door for Disney's next golden era that Tony was such a successful part of. Please find part two here. Enjoy! 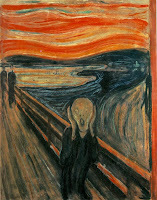 This mini-challenge is inspired by the famous artwork by Edvard Munch, titled ''the scream''! Printed in many forms, it captures a moment of silent terror, a victims scream lost against the wind whipping around in the background. The challenge is to produce a silent scream, shout or roar! Yep thats right, we want these animations silent as a lamb. If he screams as loud as Ferdinand the Bull when he sits on a bee, you've got this all wrong. There are so various different routes to be explored. Babies scream when upset, so do little children who can't get their own way. 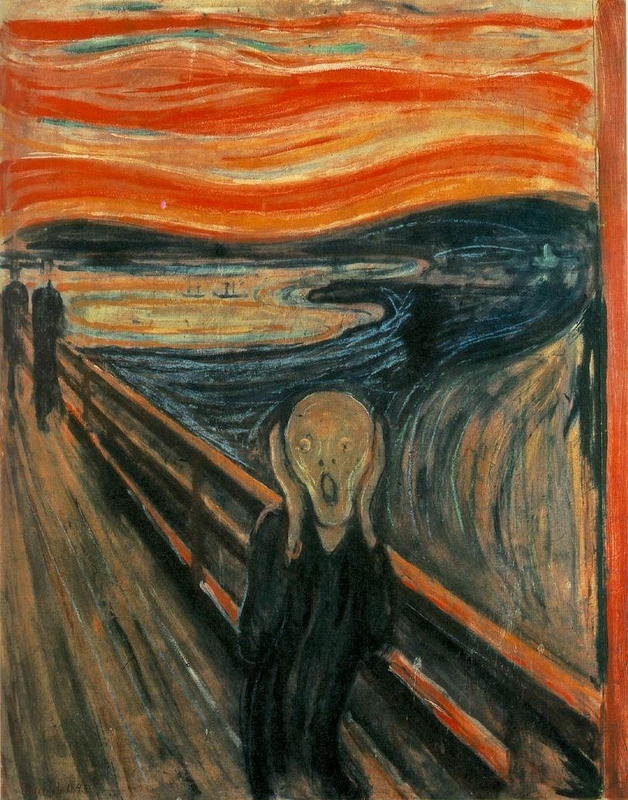 Children can scream in delight. Mortal Kombat's Sindall screams are used as a weapon, while one of the X-men uses a scream to fly. Donald Duck would scream and shout to express his temper! Remember, facial animation is hard, so keep your idea simple. You can of course put your full body into it. You may also wish to animate to sound, but mute it upon submission. As always the animation could be anywhere between 75-125 frames. If you have any questions about submission requirements, please check How-to-participate section for more details. Deadline is Monday 20th February. I'll leave you guys with an short performance by Jennifer Lawrence, who shows just how powerful a silent scream can be. To watch, please click the pic. Enjoy!